This entry was posted in Health and Medicine, SciBlogs, science, Science and Society and tagged Connett, fluoridation, fluoride, Hirzy, misrepresentation, Sydney. Bookmark the permalink. I posted on Feb 6 2015 at 1:35am that for my limited investigation, in New Zealand, years of fluoridation may be negatively correlated to cancer. I may or may not be mistaken. Today I have come across http://www.spandidos-publications.com/10.3892/mmr.2014.2079 which says fluoride can increase programmed cell death. That might be helpful against cancer but not so helpful in some cell development or repair, including of the nervous system. Better to use vitamin D to promote cell differentiation, and differentiated cells don’t proliferate? Also fluoride may be taken up by calcium plaques in arteries making them more brittle. I do not know how much would be required to reduce cerebral blood flow and hence IQ. Ken you could be taken to confuse urinary and serum fluoride. Fluoride is removed from serum not only through the urinary pathway, but also by linking to the various calcium deposits in the body. So lower urinary fluoride for some people might mean more damage going on. Allow for that and see if the explanation improves. Thanks for pointing out my mistake, Brian. It is urine F in the figure and I have corrected it. Juggling too many balls at once I am afraid. Regarding arterial calcification – we have discussed this before. However, Li et al (2012), which is often used inappropriately by anti-fluoride propagandists, has nothing do with this. It simply describes a clinical procedure for detecting vascular calcification using 18F PET. The increased F referred to is what is injected into the patient shortly before the scan. Whenever I see anti-fluoride propagandists refer to this paper I know they haven’t read it. There is not only one isotope of the fluorine atom. 18F is a radioactive one which does not last long and as it decays the particles shooting out of it can be tracked, and show where fluoride is going in the body. That, as in this study, can be used to look at things about calcium plaques in arteries. 18F has the same chemistry as the fluoride put in water. The sodium fluoride injected for the test is made with 18F instead of the stable 19F. If 18F goes to the plaques so will the 19F fluoride from water. Of course fluoride, whatever the isotope, is absorbed by actively mineralising and remineralising forms of calcium in the body. However, they do not cause calcification as anti-fluoridation propagandists claim when the use these papers. That is caused by calcium, phosphate and old age, not fluoride. Pulling out citations referring to the clinical use of 18F PET does not “prove” F causes calcification or say anything about how fluoride may stabilise or destabilise active areas of calcification. It only shows a very naive approach to use if the scientific literature to confirm a bias. I think fluoridation could be thought of as a sort of chemotherapy. It may help attack some cancer, and also stimulate saliva with the side effect of repair of teeth. But like other chemotherapy it may cause IQ problems. Adult breast cancer patients may recover from IQ loss, but I am not so sure about treatment in gestation/early years. This is a Chomsky interview which covers a wide field including a description of how if kittens’ eyes are sown shut for a certain duration after birth, then unsown, the kittens will not ever learn visual processing. Brian, you make the assumption that fluoridation causes IQ problems. But there is not a single study of fluoridation to support that claim. Quite the opposite. Broadbent et al (2014) shows the data just doesn’t support the claim. And my own simple look at the U.S. data also shows no such effect. You are simply straw-clutching to confirm your bias. Are you suggesting by “stabilise” that fluoride might impede plaque rupture? I have to assume that if plaque is “stabilised” then it will be harder for the body to metabolise it again. Same as teeth which have attracted fluoride and been stabilised by it are not so easy to break down. I think it will be in larger stiffer clumps with more risk of rupturing off the artery wall. Though Broadbent allowed for some confounding factors such as effect of population density he does not appear to have allowed for possible contaminants from the old gold mining area upstream of the “non-fluoridated” supply, and has not replied to me. Then there appears to be his lack of attention to other compounds introduced to the water when fluoridating such as the lime. * lime increases pH and so reduces lead content in the water. may have nutritional attributes, even magnesium which do not appear to be accounted for. City buses have a route name and a number. Where you go correlates very well to the name and to the number. You can choose one and say it totally explains where the bus goes so the other is of no consequence. I suggest altitude and natural fluoride are like that. The higher the altitude the less the water has travelled through fluoride-containing deposits. No, that is not what I mean by “stabilise.” As we have discussed before the secondary effects of fluoride, or any our organic or inorganic anion, in calcified deposits is purely speculative. They could help maintain a microcrystalline or amorphous state. On the other hand they may sometimes enhance crystallisation. Such anions may be seen to “stabilise” the material in a reactive form or on the other hand “stabilise” it by reducing its reactivity. By the way, calcified deposits and growing tips of bones are an obvious place for accumulation of absorbed F, but they are also an obvious place where F gets mineralised and removed from the body. It is interesting you criticised Broadbent for not considering your confounders. He obviously considered quite a few confounders for which there was data in the long term study. This contrasts with the very weak studies done in China, India and Iran where confounders were rarely considered. It surprises me that the obvious one of dental fluorosis, for which data must have been readily available, is never included as a confounder. Xiang himself did make measurements of dental fluorosis but never includes it as a confounder. We have the comic performance of Connett and his crowd who continually bad mouth Broadbent et al yet are happy to accept the poor quality studies which rarely considered confounders they use to support their claims. Even dishonestly distort the evidence from those studies as my post shows. The fact remains there is no scientific investigation of fluoridation showing problems for IQ as you assert. Your claim is simply based on bias and false wishing rather than any evidence. Brian, who is “our?” Where was this study published? Surely it is Connett who is “choosing one” – the effect of F in Xiang’s work? Yet as Xiang’s own correlation shows this only explains 3% of the variance. Connett is so blinkered as to ignore 97% of the important factors and his 3% is so ephemeral that it will probably disappear when a few other factors are considered. Yes the needed amount or excess if the kidneys are not working averagely enough. Not written to Connett since he is not being used by the PM’s Science Advisor’s commissioned study as evidence. When you go for a car warrant they do not pass you if 3 out of 4 tires are OK. Broadbent needs to get everything correct. “Our” sorry missed off the “y”. Talking about your American claim. Sorry there’s been a bit happening so I haven’t checked if you were going two-valued between fluoridated/nonfluoridated, when nonfluoridated can be a very wide range of fluoride levels from much great to less than fluoridated. Altitude may give a better figure for fluoride than just being nonfluoridated. There is a very good reason why Connett would not be used as a reputable evidence in such a report – he has not produced anything original on the subject. However, the studies of Choi et al were used in the NZ fluoridation review – Connett relies on them. By your logic you should have written to Connett or Anna Choi asking questions about the lack of confounder inclusion. But then again this is just an excuse. You have made a big thing about the strong Broadbent study while keeping mum about the extremely weak Choi study because of your bias. Teeth are not undergoing calcification- only the surface layers are involved in these reactions. I have not made any “American claim” so don’t know what you are talking about. Meanwhile, and typically, you ignore the content of my post – which I think is very important for these sort of studies and claims. Ken wrote:”And my own simple look at the U.S. data also shows no such effect. ” Can’t I call that a claim? I did write to Choi, and I mentioned you as I wrote earlier. The Broadbent study has been proclaimed as the only conclusive one and I do not think it is. So what do you call the deposition of calcium hydroxyapatite on the tooth surface, in association with magnesium the concentrated fluoride in a layer in the pellicle? Are you trying to say calcification of an artery wall goes in a lot deeper? Did Choi reply to your query? Was your query about lack of confounders? By the way Malin has not replied to my offer of a right of reply. I seem to have bad luck with those offers. Where is the Broadbent et al study described as “the only conclusive one?” Or is that your description? Calcified deposits are amorphous or micro-crystalline and hence actively reacting. Teeth are not. They are crystalline and it is only the surface layers which are actively reacting. Meanwhile, what is your reaction to my point that Xiang et al’s correlation of IQ with fluoride explains only about 3% of the variance and Connett’s overwhelming concentration on that 3%? Ken you wrote to Lisa: “So far, the only study directly relevant to community water fluoridation (CWF) is that of Broadbent et al., (2014)”. So you say it is not definitive? The solubility of fluorapatite is much lower than hydroxyapatite. It will not “actively” react so easily. Choi et al may not have taken water hardness into account. No reply to that or whether Broadbent would have. You show you have no idea of he scientific process to make such stupid distortions. Yes pure fluoroapatite has a lower solubility than hydroxyapatite – but in the real world these end members don’t normally exist. Bioapatites are roughly carbinatofluorohydroxyapatites. In reactive calcification the reactivity probably arises mainly from the very high surface area of amorphous or microcrystaline solid. Anions such a fluoride, phosphate, organic anions, etc., help to stabilise the high surface area state by inhibiting crystallisation. hydroxyapatite (Amjad et at., 1982). Brian, in the real world materials of very similar composition can exist in various forms. Classically compare the different properties of allophane or imogolite in soil (important in NZ). Their “amorphous” form strongly effects the properties of the soil. but one can find crystalline aluminosilicates of similar composition (eg kaolins or smelt it’s) which confer radically different properties on the soil. The same thing can occur with calcium hydroxy phosphates (which in the real biological world will contain organic species as well) – we can have the “amorphous” forms which we see in calcified tissues and we can have the crystalline, non-reactive, forms in bones and teeth, particularly teeth. Ken wrote: “In reactive calcification the reactivity probably arises mainly from the very high surface area of amorphous or microcrystaline solid.” But there should still be that proportionality in reactivity with fluorohydroxyapatites less than hydroxyapatities, making repair slower when fluoride is around, and probably less complete. Not sure of your impetus there. With my house undergoing painting it is only a surface matter, but definitey makes it harder to attack. Incidentally, with allophane and imogolite there is a strong reaction with fluoride whereas the reaction is much weaker for the crystalline clay minerals. So we can use fluoride to detect these reactive forms of aluminium. It is an analytical or detection method but does not imply that fluoride causes the formation of these reactive, amorphous minerals. A strong parallel with the vascular calcification detection. Fluoride can be used to detect the calcification because of its affinity for Ca but this does not mean it causes calcification. One of my articles cited said it does not happen in the abdominal aorta. Maybe there is more movement there. The aorta is the reservoir to continue supplying blood while the heart is taking in blood ready for the next thrust. So the aorta walls must be very flexible. I had thought that high blood systolic blood pressure, associated with low diastolic blood pressure, means the aorta is getting stiffer, harder to pump sufficient blood into for the reserve. Then there is vitamin K2 which is supposed to help avoid calcium depositing in the artery walls and make sure it goes to the bones. So how does it work as a test if it does not react? Who the hell said there is no reaction? F reacts with Ca in a similar way to its reaction with Al in the parallel test. But it no more causes calcification than it causes allophane. Ken: “it no more causes calcification than it causes allophane.” I am thinking that a stiffer coating is more likely to result in substrate cracking, which the body repairs by depositing cholesterol, then another stiff coat may go over that &c &c.
I find it very interesting that the pellicle on teeth builds a high concentration of fluoride in it from low concentration fluoride in saliva, with help of magnesium, proteolytic organisms. When fluoride is ingested the serum level will be high until kidney excretion, or bone deposition occurs, but you don’t want to allow an arterial deposition layer over plaque to be thought of if calcium plaque is there? I get the impression that your argument is circular, based on a misinterpretation of what Ken said. You latched on to the word “stabilise”. My interpretation is that Ken was generalising; a paper saying how a clinical test works cannot be interpreted to infer physiological mechanisms within the body. Please correct me if I’m wrong, Ken. It’s a test. It reacts. The result of the test is used as a marker. Don’t use it to try to guess other physiological mechanisms. Ken has given you good references for the physiological mechanisms you are guessing at – why not read them instead of going round in circles? And, BTW, there are lots of causes of systolic hypertension associated with diastolic hypotension. Some of them aren’t even pathological. I suppose it is going to be hard to know whether the stress of poorer IQ leads to atherosclerosis or vice versa. Brian needs to widen his horizons, get out of the assumption that fluoridation somehow causes IQ problems despite the lack of any scientific evidence for this. Ken I came across this which suggests a connection in some people. There might also be positive feedback. And this about apoptosis and vascular calcification is 14 years old and knowledge may have progressed. An insignificant shift for the mean may not be insignificant for the tails. So now I have a âchronic central nervous system injuryâ? You now appear to be saying that atherosclerosis causes systolic hypertension with diastolic hypotension, causes “chronic central nervous system injury”, and also causes lowering of IQ. Or that low IQ causes atherosclerosis. Which is it? Either way, citations are very definitely needed. Or is this just more guesswork? I take it, by your lack of comment on the subject, that you now agree with Ken that a paper saying how a clinical test works cannot be interpreted to infer physiological mechanisms within the body. (I’ve noted previously that you stop your comments and change topic when that happens). I did a reply to Ken, but it got into moderation. So I did the next one trying to explore the actual issue. But since you ask I’ll try again. “affinity” = hangs around near it or links to it? If 18F has the affinity in the arteries, which is why I referred to the study, then 19F must also. Maybe it is only on to the surface but that does not stop another layer happening. I looked at some micrograph images and it could be like that. Repeated surface layer reaction. But now I have my new apoptosis notion to add. As a boy I made audio amplifiers. “Negative feedback” circuits were incorporated to reduce distortion. A small amount of the output signal was reversed and reinjected in an earlier stage. “Positive feedback” is when it is fed back in phase and a terrible howling occurs. It is not the amplification or the feedback circuit alone which does it. I have written before that countries where more unboiled homogenized milk is consumed have more atherosclerosis. The extra xanthine oxidase from a sufficient drink of milk to neutralise stomach acid may get absorbed in to the bloodstream. Especially from the greater surface area of homogenised fat globules. We need xanthine oxidase in our liver to pull apart protein, but don’t want that to happen to our artery walls since that may also attract plaque. Brian, you are not making sense and I can only conclude your are letting your well known bias get in be way. Fluoride has an affinity for Ca (as it does for Al in my soil example). If the Ca is in a reactive form (as it is in the “amorphous” high surface area calcified tissue but not in bone [except at the growing tips] or teeth) it will react with fluoride – but of course this is an equilibrium where F is also lost from individual Ca – that is the nature of it’s reactivity. 18F is effectively a trace operating by isotopic exchange with F in the body so it will concentrate in the reactive areas and PET detects this. None if this implies that F causes calcification, the formation of reactive Ca areas. This is caused by Ca, phosphate and old age. Once formed it can provide a place for adsorption of fluoride and many other anions because if it’s high surface area and reactivity. If you see lakers in the micrograph a they are layers of the calcium phosphate or similar amorphous material in calcified tissue – forming independent of F.
Similarly 18F labelled glucose or similar compounds is used with PET to detect cancer tumours. It is a diagnostic procedure and does not “prove” F (or glucose) causes cancer. By the way, I am sure an 18F PET scan would identify calcified areas in your body. Does this mean you suffer from low IQ or (no other alternative) you started with a low IQ which caused the calcification? In simple English, calcium and fluoride ions are distributed in solution around the body. They are in a constant state of flux where they are being taken up from solution to be temporarily bound in tissues, and also being released from the tissues at the same rate they are being taken up. The constant state of flux results in equilibrium between solution and tissues. The term “temporarily” means the time calcium and fluoride spend bound in tissues varies between tissues. It can be seconds, minutes, days, months, or even years, depending on the tissue. The tissues with the highest turnover of calcium and fluoride are those for which the ions are bound in the tissue for the shortest length of time. They are the tissues where a radioactive marker, such as 18F, can be used for imaging studies, such as PET. The marker is rapidly taken up and then rapidly released. The tissues with the lowest turnover of calcium and fluoride are those where the ions are bound for the longest “temporary” time. Good examples are teeth and bone. Even though these tissues may have large amounts of calcium and fluoride in them, radioactive tracers are useless for imaging them because of the slow takeup and turnover of the ions. Now do you see why behaviour of isotopes in a clinical test such as a PET scan cannot be used to infer physiological mechanisms within the body? Ken could you please explain that statement to readers because I think it is tending to try to make them think I have been saying something I haven’t. Because it can be seen that18F has an infinity for calcium in arteries so must the ordinary 19F. And if any F forms a bond it is likely to be very strong. I am not sure about fluorhydroxyapatite but compared to hydroxyapatite fluorapatite has a solubility product many powers of ten less. What is rapid about 19F is that half of it turns into oxygen atoms in about one hour and fifty minutes, and three quarters in double that time. Since oxygen atom is less strongly electronegative than fluorine atom the oxygen may have somewhat less chance of staying bound to the artery wall where the nuclear reaction has formed it. If any appreciable amount of 18F is letting go quickly before it becomes oxygen then will it appear in the urine making it radioactive? Bit of a search. Crystalline apatite, fluoroapatite or bioapatite is not reactive (except in the surface layers) hence there is very little isotopic exchange with 18F. The ” amorphous” calcified material is not the same as bone or teeth. It has a huge surface area and does not give an XRD pattern. It does not have the low solubility product of the crystalline apatites. As for strong bonds, the isotopic exchange of F is dependent on the kinetics. The fact that it occurs indicates that the equilibrium between solution F and solid Ca-F is more rapid. I did explain what I meant by “temporarily”. Perhaps you could re-read what I said. Half-lives have nothing to do with it, or with your original comment. Ken, when you say “isotopic exchange” do you mean 18F takes the place of 19F? For if that were the case the PET test would not work if no fluoride were already present. I think fluoride would rather exchange with OH- . Stuartg, you are right half lives have nothing to with my original argument. And from what I have just quoted things may not be so temporary. Brian, your comprehension problems are showing again. No one has said there is no F in calcified deposits – quite the opposite. How could there not be F in such a reactive deposit as we all have F in our body. It is because this F i. The reactive deposits is in fairly rapid equilibrium with F in blood (ie it is reactive) that it is possible to exchange with added 18F (whereas F in the body of bones and teeth will not exchange). I do not know how much carrier F is included but if there is too much one would not see the isotopic exchange. If too little I imagine their could be problems with colloids. You may have noticed I have usually put “amorphous” in quotes and sometimes used the term “microcrystalline.” This is because terms can be operationally defined. For example in soil I have seen no XRD pattern with “amorphous” clay minerals but electron diffraction shows broad diffraction peaks of imogolite. The other thing you must realise that because these calcified materials are reactive they will be changing over time. One of the changes is crystallisation. You will notice in the paper you quote that the XRD pattern often still have broad peaks as the sharper peaks develop. Of course as crystallisation proceeds the reactivity decreases and isotopic exchange decreases so it becomes harder to detect. However, all this discussion is covering up the fact that anti-fluoride propagandists have dishonestly used these papers to claim F causes calcification when in fact all they do is show a diagnostic method for detecting calcification. Very dishonest and you are guilty because of your attempt to excuse that and confuse the issue. Similarly your reference to the half-life of 18F is a disingenuous attempt to divert. It has nothing to do with the chemical or biological reactions involved in calcification or its diagnosis except the practicalities of administering the isotope and measuring its location (and getting the material to hospitals after manufacture). As for longer term effects of fluoride on the crystallisation of calcified deposits this is obviously complicated. As I have said the literature can be cited to show both retardation and enhancement. But whatever, this is a secondary effect – fluoride does not cause calcification as the anti-fluoride propagandists dishonestly claim. Other than isotopic exchange there must be ionic exchange such as in an ion exchange resin in which fluoride jumps in and stays and pushes chloride out. Normally, ions on an ion-exchange material are in rapid equilibrium with those in solution so are detected by isotopic exchange. You are forgetting that there are two processes of incorporating fluoride, and that the formation of microcrystalline plaque would more likely be like the initial formation of teeth in which fluoride builds a harder structure. How does that apply when using an ion exchange resin to remove fluoride from water, for dialysis for example? I am not forgetting that crystallisation in calcified deposits (which mean reduction of reactivity of the macro-crystalline phases formed) is similar to formation of teeth and bones – not at all. What gave you that impression? 18F is not involved in process of electrolyte removal for dialysis up using ion exchange material. Ken can we be clear about ion exchange, and isotopic exchange? In an ion exchange water purifier the process is not isotopic exchange. I don’t think isotopic exchange is the only way fluoride gets into arterial wall material, 18F or 19F, or any other F. I think ion exchange would also happen. Then perhaps as a result apoptosis happens and a focus for microcrystalline growth is brought about. Then with fluoride ions around they may incorporate into the microcrystals as they microscopically grow. I believe microcrystals built with fluoride in their structure will be harder for the body to undo than microcrystals without fluoride in their structure. You are purposely burbling to confuse the issue, Brain. Seeing you are into citing papers at the moment what about finding one that shows evidence that fluoride causes calcification as you are claiming. Instead of relying one ones that don’t support your claim. Thoughts and beliefs, notions and ponderings may be acceptable to religions, but science requires consistent evidence. Where is the scientific evidence for your claims/beliefs? That paper showed that blood vessels could pick up fluoride. It was not trying to show fluoride causes calcification. That is because rats with damaged kidneys were getting a greater build up of plaque with more fluoride. Though with normal kidneys a bit of fluoride may have helped prevent calcification of the aorta. Where is your evidence that fluoride causes calcification? “Could”, “might” – if that’s your own respons to the data sources you are using, then they are hardly definitive. Show us some reliable research. Unrelated, biased opinion pieces are not research. Brian, you like other anti-fluoride propagandists, have consistently pushed the myth that fluoride causes calcification. In the process you have used the same two papers that repeatedly appear in “natural” health web sites and magazines as “proof” of the myth. This is dishonest. The 18F PET papers describe a clinical diagnosis procedure. The uptake of F referred to is the uptake of the 18F injected shortly before scanning. It did. If cause the calcification it is detecting. The rat study by Ana Martín-Pardillos et al., refers to secondary effects – and I initially provided it to you as an example of one of the possible secondary effects. They were considering the possible effects of F on the transformation of “amorphous” calcium phosphate into more crystalline hydroxyapatite. Their hypothesis was not that F cause the calcification but they were asking what effect fluoride had on existing calcified deposits. Their calcification was not caused by F but by the fact that the rats has 5/6 of the kidneys removed and were given a high phosphate diet to promote calcification. Their comments on possible consideration of social policy referred to speculated effects on patients with chronic kidney disease (who anyway must take care with diet, etc.) not the ordinary person. In fact they refer to their results indicating the possible inhibition of calcification by F in the normal person. One can speculate on whether F plays a protective role on existing calcified deposits (via stabilisation of “amorphous” forms) or a destabilising role (through stabilisation of macro-crystalline forms) and the consequences of these. But the fact remains that fluoride does not cause calcification and the promotion of that myth diverts attention away from the real causes. Ken readers may find it hard to know whether your word “stabilisation” refers to improved arteries i.e. as if the patient’s trouble is stabilised, or more stable deposits, therefore worsened arteries. About any increase of deposits. As in a bank where your pay automatically comes in, a block on withdrawals is not putting money into the account but the amount in the account will increase. Brian, it is dishonest of you to pretend to be confused about a word as a way of protecting the myth that community water fluoridation causes calcification. Yiu have not been able to produce a single study to support that myth. Why not face up to it and admit it is a myth? One dishonestly promoted by anti-fluoride propagandists. Ken here is another one. Serotonin reuptake inhibitors (antidepressants) do not produce serotonin. But because they reduce the reuptake, the amount around is increased. I suppose you will again fail to address that issue, that if fluoride makes it harder for the body to remove calcified deposits they will increase more. Ken the fluoride safety studies frequently look like marketers’ sale pushes. They rely on people having limited thinking, not able to see the effects on invidious minorities, like pregnant women with sublinical diabetes and excess thirst, embryoes, aged people where kidney function declines. And those many nuisance people with reduced kidney function as a result of diabetes. Studies ought to be done over and honestly acknowledge those categories: get rid of their bias to the mean. You acknowledge that the myth of community water fluoridation causing calcification is a myth and is not supported by the papers you advance (the same ones used by anti-fluoride propagandists and the “natural”/alternative health sources of misinformation ) and then we can process to discuss speculation about the effect of fluoride on existing g calcified deposits. Until you acknowledge this I will continue to see your responses and diversions as an attempt to obscure the issue and to protect the myth. Firstly Ken, do you like many people agree that the person who fired the gun is the killer, or do you proclaim it is the bullet that did it? Because you seem to want to add that distinction in this case. Ken you say if people have poor health and fluoride may be a risk for them, they have to look after themselves. That philosophy of absolving the public purse from responsibility I find very toxic. There is another recent example where a city will not fund the million dollar medical bill of a baby who was injured by a thunderflash in a mistaken drug raid. Fluoridation is put forth as an facet of a caring society. To reaffirm you are caring please endorse for the future plans to help people find whether they individually will be helped or harmed. “We recruited 180 schoolchildren (10-12 years old) from high fluoride exposure (1.40 mg/L) and control areas (0.63 mg/L) in Tianjin City, China. 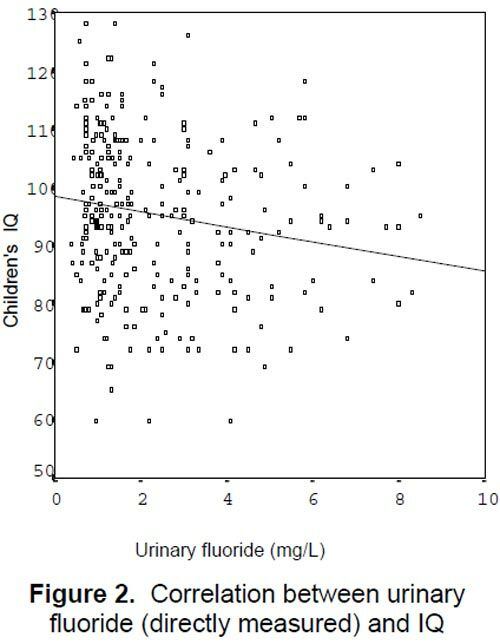 The children’s IQ, fluoride contents in drinking water (W-F), serum (S-F) and urine (U-F); serum thyroid hormone levels, COMT Val158Met polymorphism, and plasma proteomic profiling were determined. Significant high levels of W-F, S-F, U-F, along with poor IQ scores were observed in the high fluoride exposure group compared with those in control (all P < 0.05)"
I note i. That study, Brian, that there was no significant relationship of IQ and water F. Pity they didn’t record dental fluorosis. I’m repeating myself, since you do not seem to have read my previous comment. The calcium and fluoride in all tissues is in constant flux but maintains an equilibrium. The attachment of ions to tissues is temporary (i.e. is not permanent) but may last from seconds to years depending on the individual tissue. Those tissues with the highest rate of uptake of calcium and fluoride must also have the highest rate of release of calcium and fluoride in order to maintain the equilibrium. Just because a tissue takes up fluoride, no matter how rapid or temporary the uptake, does not mean that fluoride causes calcification. It doesn’t matter how much you burble, or how many times you try to change the topic, fluoride does not cause calcification. Since you have not provided evidence to the contrary, no matter how many times you have been asked to, all of your “could”, “might”, ” I have furthered the notion”, “I believe”, etc, are WAGs. Without evidence they are faith, not science, and can safely be ignored. In the future, consider providing the evidence that someone asks you for. It would result in a more interesting conversation than you burbling and flitting from idea to idea in an attempt to hide the lack of evidence behind your faith. I think that’s enough with this poor, intermittent connection. Ken how was the higher exposure measured, then, which was significantly related, especially for certain genetic types? Read the paper, Brian. They used an ion selective electrode for F. The correlation values of IQ with water F were r=0.11 and p=0.08 (Table 2). Ken I think you are still ignoring individual genetics. Think what you liked – I answered your question which related to how F was measured and the lack of correlation of water F with IQ. Now please, that should be the end of it. You have refused to confirm that the lies told about CWF causing F are a myth. Why should anyone continue any discussion with you as the just amount to diversions. And, Ken how much visible dental fluorosis would you expect at 1.4 mg/L, of sufficient nature to explain the effect? Ken, The whole time on this group I have been asking for consideration of minorities. Now when one comes up with the COMT polymorphism you seem to be wanting to shut down discussion. Brian, you are the one attempting to obscure and divert the discussion. You were not able to produce any study showing community water fluoridation causes calcification. So rather than acknowledging that you go off at tangent and attempt to divert the discussion. You show you don’t respect your discussion partners – why should I waste any more time on you? Ken you are saying then, that phosphate &c caused the calcification and that fluoride played no part in making it harder for the body to remove it. If the body finds it harder to remove it then more may build up on top. It is still not the fluoride doing the building, but it may be hampering the body’s ability to interrupt the process. Are you making that distinction or are you say the fluoride does not hamper the healing process so the calcification does not increase with its presence? I have really asked this a number of times but you do not address it kindly. Stuartg, regarding you 12:38 post, if the body maintained an equilibrium then why would some people get calcification at a young age? May not the microcrystals in some bodies get exchange of OH- with F- which is harder for enzymatic processes to undo than do? Normally people acknowledge things by not disagreeing, though sometimes it is because there is not the time or someone says part of their argument is sidetracking, or something. I note I have said a lot that you have not disagreed with. That seems to be a pretty good acknowledgement. Noting again I was only using it as evidence that arteries can take up fluoride. Ken wrote: “Read the paper, Brian. They used an ion selective electrode for F. The correlation values of IQ with water F were r=0.11 and p=0.08 (Table 2).” Thanks IQ appears to increasing, then with fluoridation, but only explaining 1%, and if you did the experiment 12 times you would likely get that result once by chance. Ken, thanks for exhorting us to look in more deeply. I now have the Zhang paper. Note as in the abstract above there are strong negative correlations between urinary, serum fluoride concentrations and IQ. That is when the both groups, higher and lower fluoride are considered summed together. Taking the higher and lower water fluoride areas separately, and comparing, the high minus 1SD urinary (and serum) is lower than the lower plus 1SD. The correlation you gave is the partial between water fluoride level and IQ, I guess with urinary and serum effects excluded, which would seem to explain why with that overlap in range and ability of the individual to excrete.